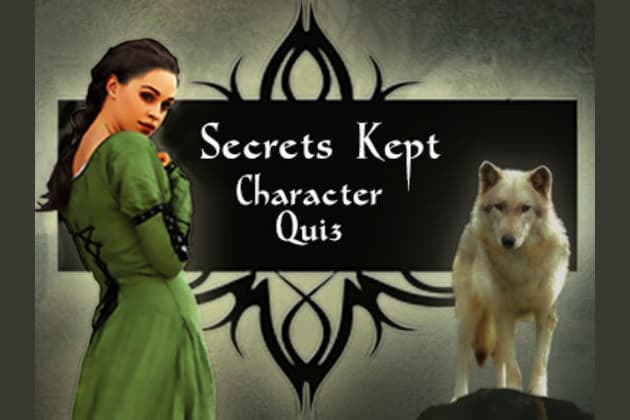 Which Character of Secrets Kept are you? Kael, some say he is a half-elf, but he never knew his mother. His father was one of the Lords of the elven council and never spoke about her. Kael was determined to follow the path of his father until tragedy struck. Not once, but twice, losing his wife, his son, and his sister. He vows to never love again and ponders accepting the High Guardian’s recommendation to join the Circle. Ayianna is a young half-elf who dreams of becoming a Stargazer. Unfortunately, her parents have other plans, and they betroth her to Desmond, a dashing young man with an eye for the royal courts of Badara. But then her father is murdered, and she discovers her family has been keeping secrets. Nevin Saeed. High Guardian and headmaster of the Kayulm’sa Nutraadzi. The oldest living elf among the nations, he saw the last sacrifice performed and was one of the first to volunteer to become a Guardian, even if he was only five years old at the time. But he’d rather forget those memories. Now death’s fingertips are tugging at his soul, and he must choose his successor among the remaining Nevins to lead the Guardian Circle. Prince Vian, Son of King Valdamar of Badara, has lived a sheltered life of ease, but his father is distant, and the servants whisper behind his back. Alone, he finds friendship with Desmond, hoping to win the approval of his father when the time comes for him to take the throne. Desmond, a draper of the finest silks and weaves inherited his father’s business. He is as shrewd as he is handsome and wants nothing more than to be Prince Vian’s right hand man, and to fulfil the position, he needs a wife. Sorceress Semine, the high priestess of Raezana. She had once been on the path to becoming a guardian, but her mentor had persuaded her to join him on a rescue mission. Free the glorious being from the Underworld, he said, and since then, Semine has done nothing but the will of Raezana. Not without a price. Hadrian is a dwarf whose life-long mission is to unite the clans of his ancestors as he serves as a guardian and ambassador to the three dwarven clans of Nälu. The choices of his past haunt him and the rest of the guardians question his allegiance, except Saeed. A grouchy old dwarf, he could care less what others think about him. Nerissa is a merwoman from Ganya and serves with Saeed as a guardian and ambassador for the merfolk. Living between land and sea, merfolk were never meant to live as long as she, and soon she will need to choose her final resting place, but first she must carry out one final mission. Rescue the king and bring the dragons. Rediscover the characters of Nälu and what part you might have played in the events of Secrets Kept.